Images of children climbing up into tree-houses in the summer months chatting away till the yawn of the sun, blankets laid on wooden floors as they watch the stars and web of constellations – this was a vivid image, one I watched on television and remained etched in my memory. But this kind of childhood was far beyond reach having grown up in urban landscapes. The only trees left to climb are concrete jungles with flights of stairs. 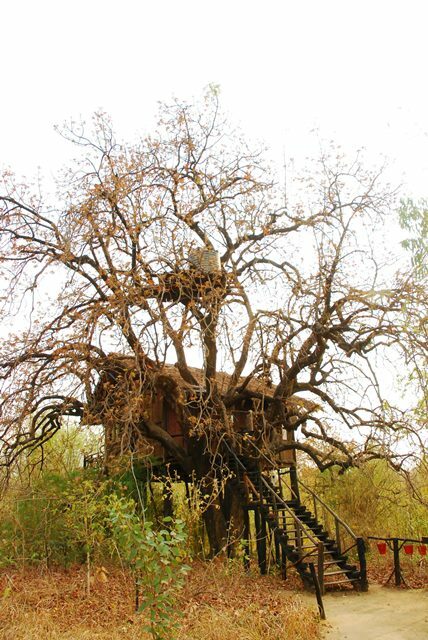 Hence the thought of retreating to an actual tree-house was a sublime idea, a childhood dream waiting to be fulfilled. 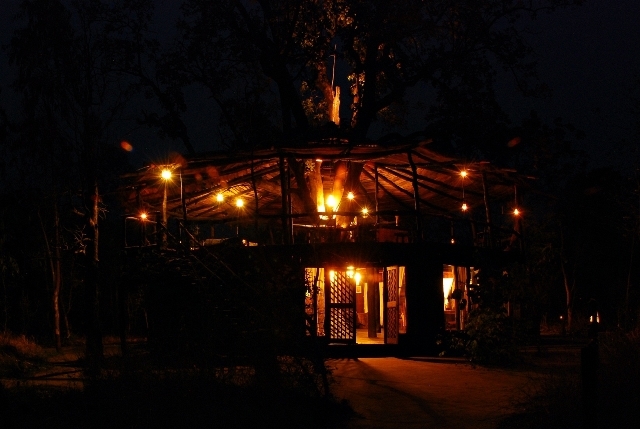 Treehouse Hideaway is an exclusive safari experience in Bandhavgarh National Park in Madhya Pradesh, India. 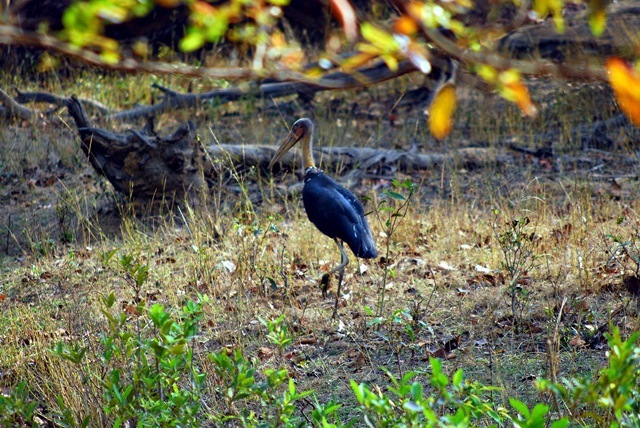 This jungle throve is also a prime area for spotting the maharajah of the forest – the Bengal Tiger. 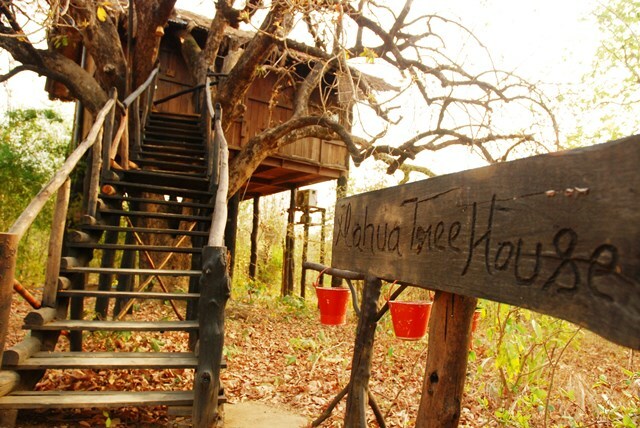 Sitting on 21 acres of land the hideaway has five exclusive tree houses built on the five largest trees in this area; the Mahua, Pepal, Sal, Tendu and Palash trees. Privacy is guaranteed as each tree house offers fantastic views of the forest and some even overlooking the rolling Vindhyan mountain range. During the construction of each unit, the owners were mindful to keep as much land untouched as possible often clearing nothing more than pathways for easy access. Recycled wood from railway tracks and fallen timber were used to construct the treehouse matching each piece into a jigsaw puzzle of natural architecture. 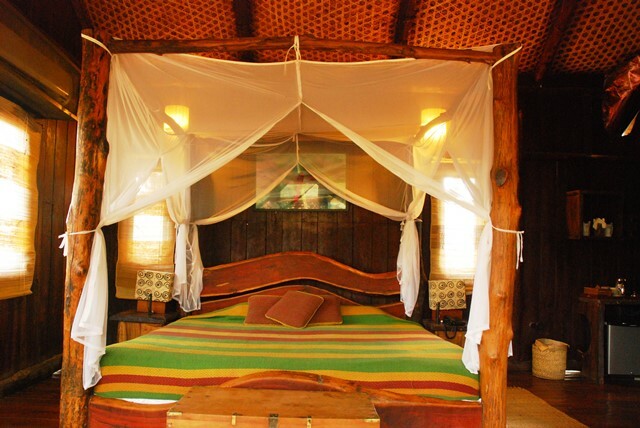 The tree house is spacious with an open balcony that is accessible from the bedroom or bathroom, a comfortable sitting area, writing desk and a huge inviting four poster king-size bed. Interior designs are intentionally organic with splashes of earthy hues and photos of wildlife to remind you that nature is really in your backyard. Spotting tigers is the major highlight for most visiting into this area. The Bandhavgarh National Park authorities recently put a restriction to the number of jeeps entering the park and pre-determined the routes for each vehicle. 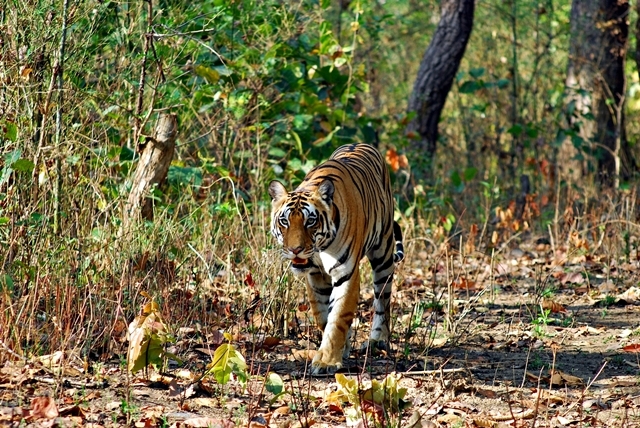 Although an inconvenience for naturalists and guides to guarantee tiger sightings, this ban has greatly helped lessen the level of human activity and impact in the park. Jeeps no longer crowd in huge numbers just to catch glimpse of a tiger, instead jeeps are evenly assigned to various routes avoiding congestion. In the summer when the sun is sweltering hot, the morning safaris are a pleasant welcome. Departing at 5.45am in the crack of dawn, our jeep enters the forest through pathways of eerie dry spindly bamboo branches. The feeling was as if entering a ghost forest keeping us at the edge of our seats. The cool dawn breeze swivels in the hair. But within 500m the sight changes as bright green leaves of Sal trees emerged in the background of brown hues. Young shoots just beginning to form giving life to the jungle, otherwise quite bare. I was told that after the monsoon between October to December, the forest transforms into a blanket of lush green foliage. We soon caught sight of some jungle ‘commoners’ – the spotted deer, barking deer, sambar deer, wild boar, langur and macaque. These animals have grown accustomed to jeeps and gawking visitors as they go about their daily activity. 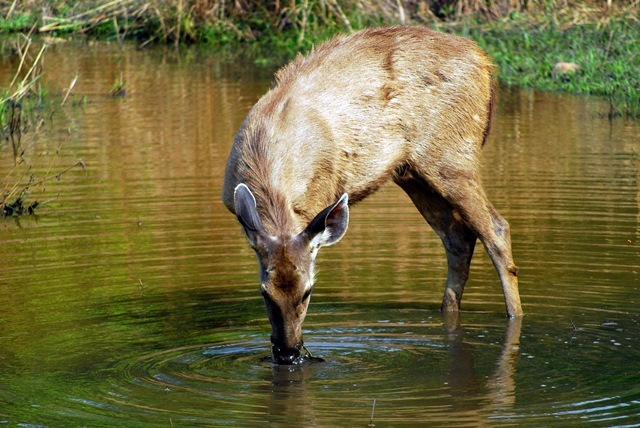 At watering holes, birds are abundant with a mix of endemic and migratory birds. The eye catching ones include the Indian long billed vulture, Grey hornbill, the beautiful Green Bee Eater, the grand Indian roller and the stern looking Lesser Adjutant Stork. 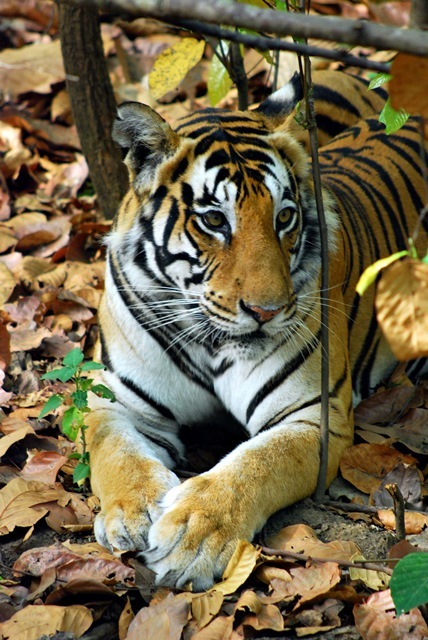 Bandhavgarh National Park is home to more than 22 species of mammals and 250 species of birds. Along the dirt roads, we noticed a gigantic silhouette, unlike any other mammal found in this area. 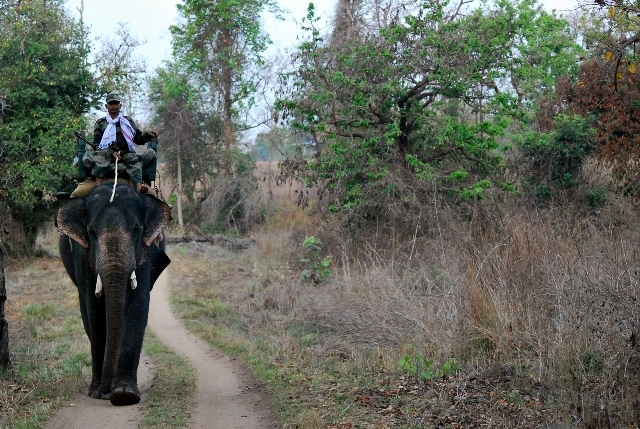 As we approached the silhouette emerged into a grey bodied Asian Elephant with a man on it. A mahout, that’s what they call it. Obviously not belonging to this forest, elephants are used by park guides to spot tigers travelling at a very slow speed with little noise and interference. Once the mahout spots the tiger, he alerts the gate post and reports are churned out every morning and evening in preparation for the next safari ride. Wildlife has its way of protecting itself; Vinod our naturalist tells us that in spotting tigers his sense of sight, smell and sound are completely focused on picking up different signals from nature. Barking deers would make short alarm barks whilst monkeys with screech and deer huddle together at the sight of the terrifying predator. 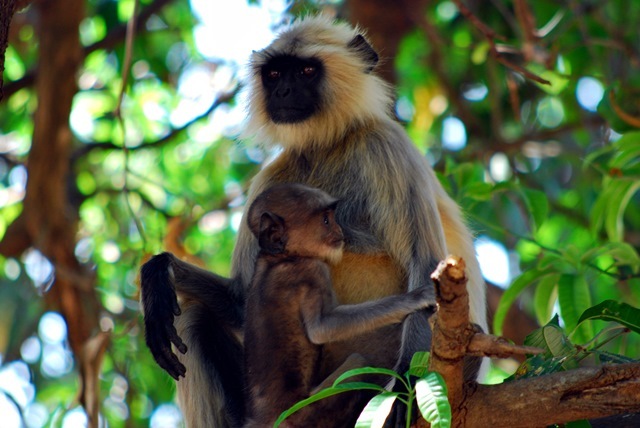 Langurs and deer have a symbiotic relationship, the langur also called the ‘eye of the forest’ spots for predators from high and lofty trees whilst the deer with their keen sense of smell sniff their way out of danger. 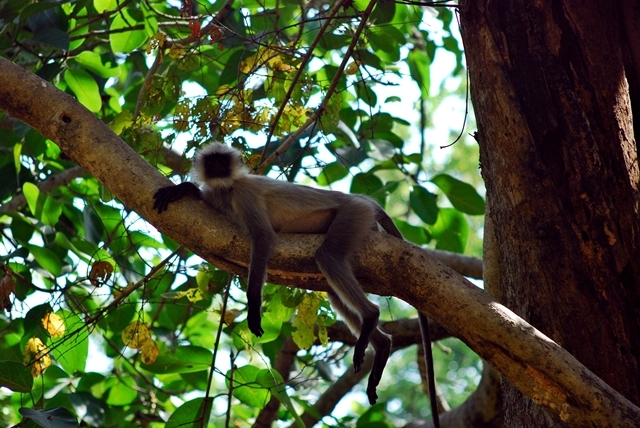 It is a common sight to see langurs and deer lounging together – for obvious reason, safety and survival. Returning to the treehouse after more than three hours of wildlife spotting, the staffs at tree house really looks into the needs of the guests, providing fresh cool towels to freshen up and refreshing lime juice for the dry throat. A generous spread of cereal, toasts, eggs, potato cakes and juices are served. Meals at the Tree House Hideaway are always generous but never too heavy, with a great mix of Indian flavours and organic greens bought from the local markets and a small portion from the resident veggie patch. In the summer, pretty much the entire afternoon is spent relaxing at the tree house. The temperature rises to uncomfortable levels and the air is dry and arid. But the tree house remains a welcoming treat. Walking up the dainty stairs of my tree house, a family of langurs greet me as I watched them play among my great and grand Mahua tree house. A childhood dream fulfilled. By Air: Fly from Delhi, Agra or Varanasi to Khajuraho and drive (7-8 hours) to Tala park entrance at Bandhavgarh. Nearest airport from the park is Khajuraho. From the airport to the park, you will need road transfer. By Rail: Nearest railway station is Umaria after Katni railway station, from there it is about 2 hours to the park. Alternatively, take the overnight train from Delhi to Umaria and drive (30 minutes) to the park. 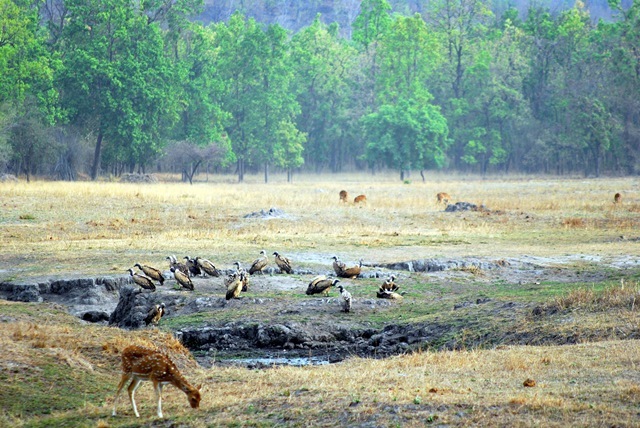 Best time to visit: The peak season for Kanha National Park visits is the winter season, from October to February. During the summer months from March to June, tiger sightings are at its best as the grasslands dries up making it easier to spot wild animals. The park is closed from July to September during the monsoon season. Not far from Singinawa is another remarkable story of change makers who have steered away from mass tourism to create a unique kind of travel with a focus on nature and people. 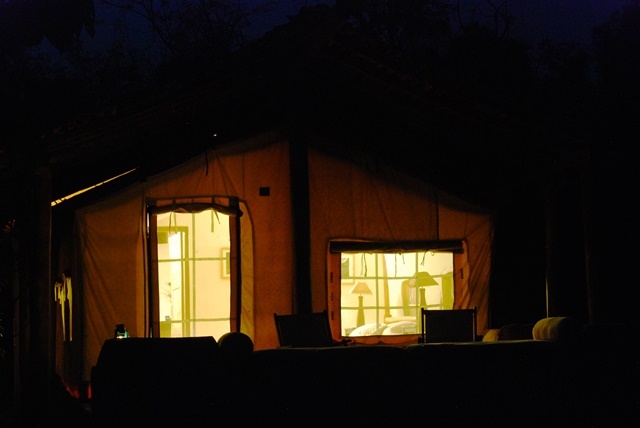 The making of Shergarh Tented Camp is a story that tugs at heartstrings. It is a story of love and passion resulting in a concoction of wildlife hospitality. Jehan Bhujwala grew up in the metropolitan city of Bombay having only the concrete jungle as his playground. He furthered his studies in geology and mastered in it but soon realized an insatiable longing to live life in the wild. He purchased a 21-acre land on the fringe of the buffer zone adjacent to Kanha National Park in 2001 whilst working at Kipling Camp, the first camp built near Mukki gate. In 2002 Katie, a British girl from a village close to Bath in the United Kingdom was so drawn to India after an extended backpacking trip that she decided to find a job at the same camp, and love struck. At that time, Jehan was living in a tiny mud house on his property and had already started conceptualizing the idea of a tented camp. With extra hands and a like-minded partner, ideas soon evolved into reality and Jehan and Katie began building the camp. “This was not going to be any ordinary camp. 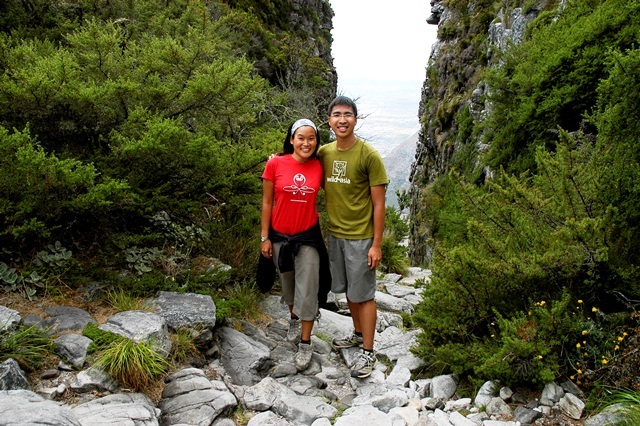 With Jehan’s experience as a naturalist and my insight on travels after much destination hopping during my backpacking years, we both decide that this camp will honour and respect the environment and people living around,” explained Katie. Due to poor knowledge of sustainable agriculture practices, the 21 acre land was completely degraded and overused. Katie explained that the entire land space was filled with invasive and chocking eucalyptus trees, biodiversity was close to barrenness and the land was starved. The pair spent many months and years regenerating the land, chopping down eucalyptus for construction and firewood in the winters. Indigenous trees were reintroduced to the land and the beautiful waterbed that sits in the middle of the land continued to feed the trees. We walked past the waterbed to reach our tents, and much to our delight, we saw egrets, commorants, kingfishers and bee- eaters basking in the water. Katie tells us that jackals and wild boars frequently roam the area and just at the entrance amongst the patch of tall green meadows, a jungle cat has made that his home. 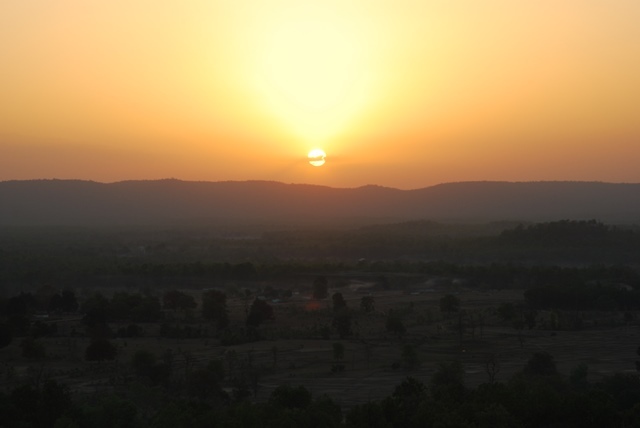 Katie recollects an incident when the name Shergarh meaning “Home of the Tiger” resonated. “In November 2008, a 5-year old male tiger strayed from the core forest and took refuge from (in?) the surrounding paddy fields”. 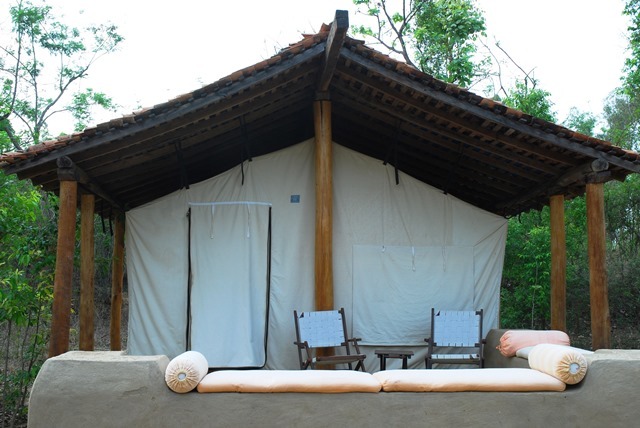 As we ambled into the vicinity of Shergarh Tented camp in Kanha, we were expecting high A-framed tents, foldable camp beds, make shift toilets and simple skinny mattresses, but what we found at Shergargh was a haven of comfort and simplicity. The rugged looking canvas tent is tied securely on concrete A-frame structure with a sturdy roof made of handmade clay roof tiles. 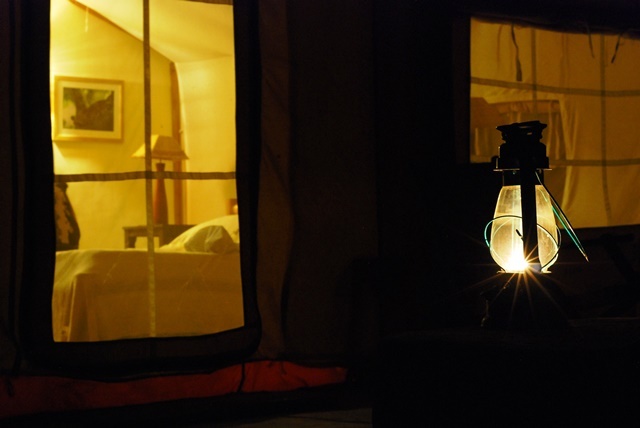 The tents are incredibly roomy inside with a large king sized bed, bedside tables and a spacious permanent toilet, shower and open closet area. Just outside the tent, a few plush cushion mattresses and deck chairs are cleverly positioned to great views of the lake and the open skies as we watch the stars emerge at night. The tents take on names of indigenous trees in India such as Tulsi (Indian basil), Aam (mango), Jamun (blackberry), Imli (tamarind), Mahua and Neem. Many of these trees were re-planted around the property in their effort to revive the degraded land. While it’s easy to take on a tiger-centric approach as tiger sightings are almost a daily affair, the couple knew that that would not do justice to the rich diversity in Kanha. 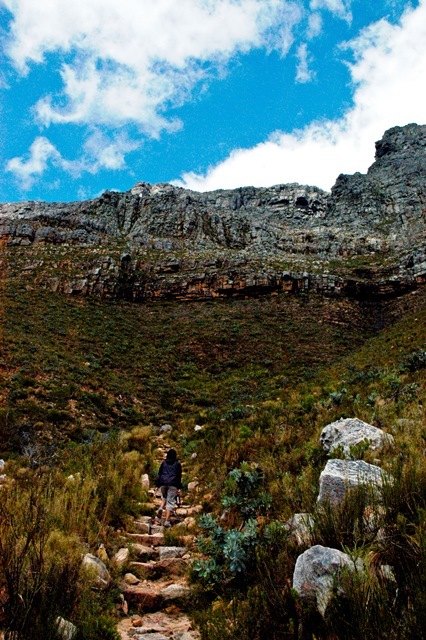 Instead they have expanded their list of activities to include village visits, walking hikes and bike tours. In October 2011, Shergarh will be offering bespoke bike tours from half day tours to 3-day tours. These cycle ‘tolla’ tours (tolla meaning village) will take guests off the beaten track from Kanha through villages and obscure towns to Pench National Park (approximately 200km) or Bandhavgargh National Park (approximately 250km). Exploring the Madhya Pradesh region on two wheels opens a new spectrum of experience for guests giving them a chance to interact with locals, savour chai at roadside stalls, weave through tall paddy fields and stay with local communities. For a more rustic camping experience, guests have the option of camping out in the open and cooking meals over fire and charcoal. Whether it is a lodge or a tented camp, conscious travellers are now looking for more than just a comfortable place to stay. I found myself searching for operators who are committed to preserving the destination and operators that can offer authentic experiences crafted through their commitment and understanding of the destination and the surrounding people. At Kanha, I found two champion operators who are investing time and resources to preserve the very thing that tourists come to Kanha for, a genuine ‘Jungle Book’ experience. By Air: Nagpur is the nearest airport to Kanha National Park. Other airports include Raipur and Jabalpur. These airports are all connected to major cities in India. By Train: Jabalpur is a convenient rail route to head towards Kanha National Park. 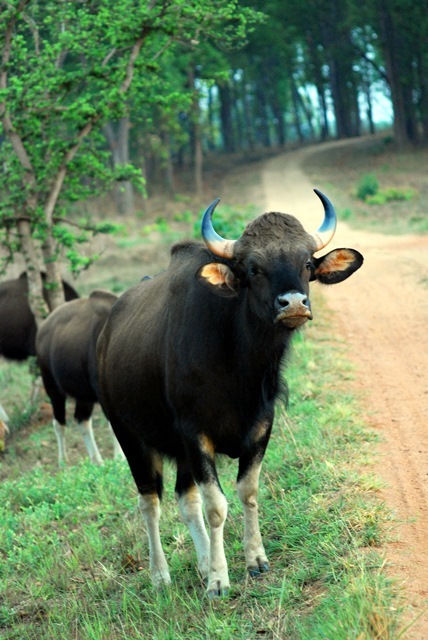 By Road: Kanha National Park is well connected with major roads from Jabalpur (175kms), Nagpur (266kms) and Raipur (219kms). 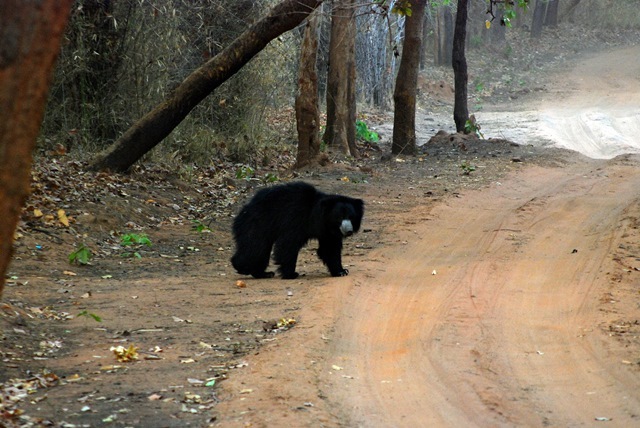 Kanha also has a good network of roads connecting to surrounding national parks such as Bandhavgarh, Pench, Panna, Achanakmar and Phen National Park. 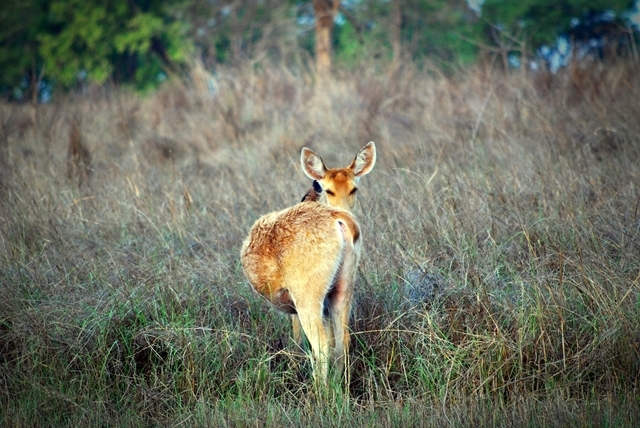 Best time to visit: The peak season for Kanha National Park visits is the winter season, from October to February. During the summer months from March to June, tiger sightings are at its best as the grasslands dries up making it easier to spot wild animals. The park is closed from mid-June to October during the monsoon season. Singinawa Jungle Lodge (Protector of the Sacred Forest) My visit to Singinawa Jungle Lodge fuelled my passion to discover this unique relationship between tourism and conservation. I met with Dr…. My visit to Singinawa Jungle Lodge fuelled my passion to discover this unique relationship between tourism and conservation. I met with Dr. Latika Nath Rana, a petite lady with captivating big brown eyes and her husband, Nanda SJB Rana, a friendly man with an imposing build. Both wildlife enthusiasts heeded their passion for the wild and eventually led them to cross paths. Latika is a wildlife biologist and the first woman to be awarded a doctorate on tiger conservation and management from the University of Oxford. She is also fondly dubbed as the “Tiger Princess” being married to Nanda who hails from the Royal Rana family of Nepal. Nanda is a tiger photography expert and film producer having worked for notable organizations such as National Geographic, BBC and Discovery Channel. Both knew that they had a strong role in the fight to save tigers. With their wealth of knowledge on tigers and Nanda’s love for hospitality, they bought an initial piece of land just outside of the buffer zone bordering a local town named Bayar. 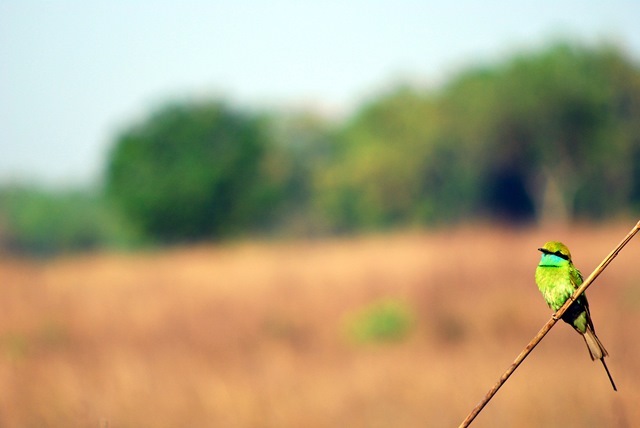 It was evident that the main reason tourists visited Kanha is for the wildlife, more specifically for the tiger. The pair knew all too well that the fight to save tigers is not a single minded quest; instead it required tourists to be educated, locals to sense pride, government to buck up and private enterprises to take on the role as catalysts. Hence the inception of ‘Singinawa’, which takes its meaning from a Sherpa term, the “Protector of the Sacred Forest”. Nanda understands the need and importance of embracing the local community, “if we start something, it needs to make a difference to the people around it”. They hired over 350 local people for the construction of Singinawa. For 10 months, a small community was formed as local men shared craftsmen skills, exchange stories of wildlife encounters, and shared life together. Many of them stayed on to be part of the Singinawa family. The construction of Singinawa Lodge was no easy feat with many minute considerations to take into account in order to lessen the impact on the environment. 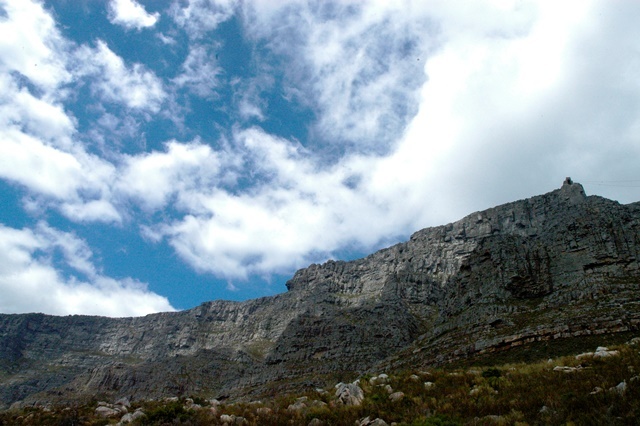 Details such as land use, building material, waste management, energy source and water management and wildlife management were part of the equation. A sustainable property was the only kind of property that Latika was willing to build, stating, “If I as a conservationist and wildlife biologist set a place and don’t think about conserving it, who will? It is a responsibility I owe”. Today, Singinawa provides affordable and comfortable living with a grand main house and 12 individual cottages dotted around the 55 acre land. The once degraded land choked by lantana has now been restored and it is home to two resident leopards, chital, wild dog and wild boar. 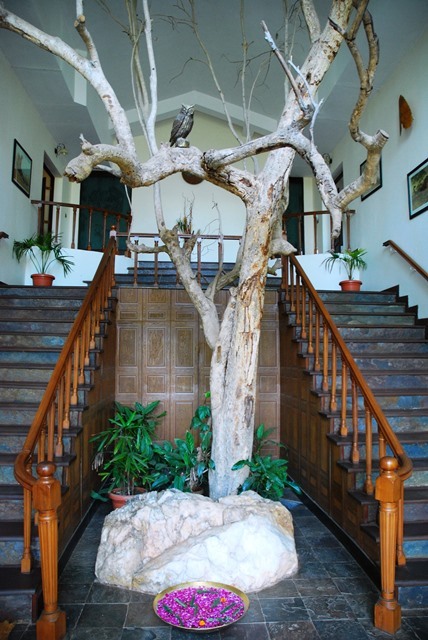 Every structure is designed and built around existing trees and a great evidence of that is upon entering the main house with a lofty tree at our welcome. The interiors of the main house are decorated with heavy wooden furniture and leather bound chairs giving the impression of castle, perhaps influenced by Nanda’s upbringing of living in palaces most of this childhood. The grandeur of this building is further enhanced by the magnificent photos of tigers set in bold frames, all taken by Nanda who is notably the only photographer who has documented six generations of tigers in Bandhavgarh National Park just six hours away. On wintry nights, the cosy fireplace in the library makes for a perfect seating for stories. 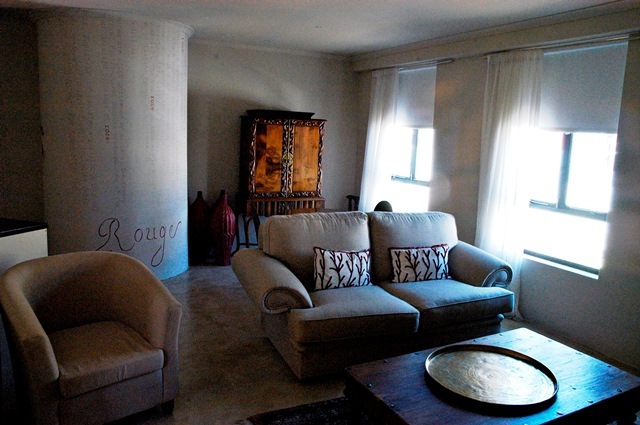 The double walls provide adequate insulation in the winter and perfect cooling in the summer. A natural air cooling system channels hot air out and cool air in eliminating the need for air conditioning in the main hall. And where possible, without the disturbance of langurs and macaques, solar panels have been fitted to provide energy for external lighting. As conservationists at heart, it wasn’t enough just to set up a lodge for wildlife enthusiasts or holiday makers. Latika and Nanda thought up innovative ways to raise money for conservation and community development projects. Last year, Latika rallied a group of well-known artists from all over the world for a 10-day retreat the lodge. Surrounded by incredible wildlife, great food and organic inspiration, the artists produced passion-laden paintings that were later auctioned to raise funds for tiger conservation projects such as the building of watering holes for tigers in Kanha. In 2008, the Singinawa Foundation was established with a steady flow of funds coming from the Spa at Singinawa. Guests who pay to be pampered at the Spa are contributing to the wellbeing of the villagers around the lodge. Through monies raised, medical camps are organized and critically ill villagers are being sent to hospitals that they could never afford to pay. The need never stops and as long as operators like Singinawa continues to thrive, protected areas are a little safer, wildlife can continue to flourish and local communities will grow in their sense of pride and belonging that they too are “Protectors of the Sacred Forest”. 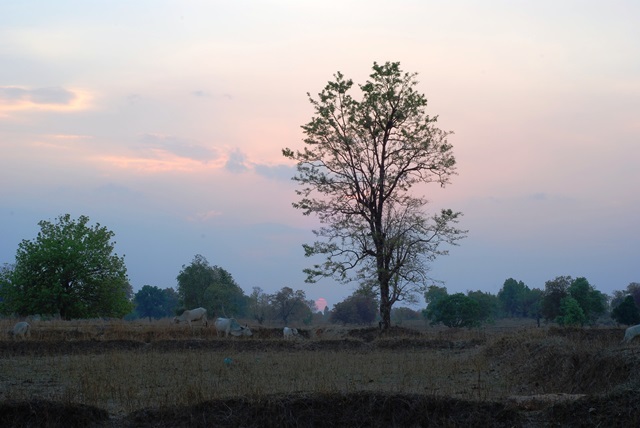 The heat of summer penetrated our light clothing and although the air was dry and arid, the scent of the forest laced through the air, hinting evidence that we are indeed in the heart of Central India, the Madhya Pradesh region where Kanha National Park sits. Famed for its lush sal and bamboo forests, tall grassy meadows and deep ravines, Kanha was the hub of inspiration for Rudyard Kipling’s famous novel, “The Jungle Book”. 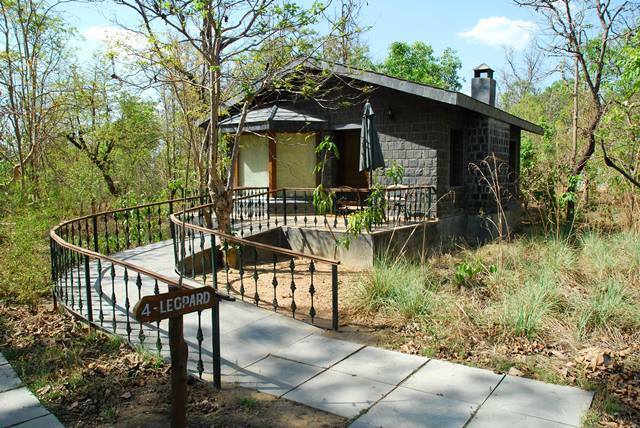 There are only a handful of lodges on the quiet south side of Kanha, near the Mukki gate, one of three gates into the national park. Our choice proved to be a great advantage as fewer jeeps are allowed into the park via this gate providing guests a more secluded wildlife experience. Kanha is one of the best managed and monitored parks in India with dedicated park rangers guarding the forests and guiding guests through this magical natural labyrinth. Morning safaris start at 5am just before the break of dawn. Open deck jeeps form a neat queue in front of the Mukki gate as vehicles register. There is a swell of excitement despite the groggy daze of a premature morning. I was armed with a pair of binoculars and a notebook to pen my sightings while my husband meddled with his digital DSLR camera ready to capture a ‘National Geographic’ moment, in case nature decided to surprise us. A park ranger leapt into our jeep , introduced himself, muttered a few words to our naturalist from the lodge where we stayed at, and our engines sputtered to life. The light mist parted as we caught the first glimpse of the magnificent sal trees stretching for miles with banyans dotted around providing shade and cover for the endemic swamp deer or better known as barasingha, spotted deer also known as chital, wild boars and gaurs. A symphony of morning chirps weaved through the air as we caught birds in flight and land birds crossing our path. The day had just begun as the first few rays of light broke from the horizon. The mahout was already at work. A great big silhouette teased my eyes as I saw huge ears flapping and four giant feet taking gentle strides towards our jeep. Could it be? Yes it was! An elephant with a man riding him atop. 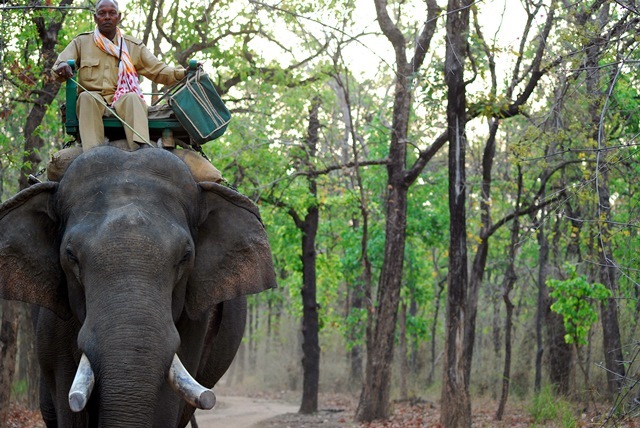 The mahout smiled and exchanged a few words with our park ranger. 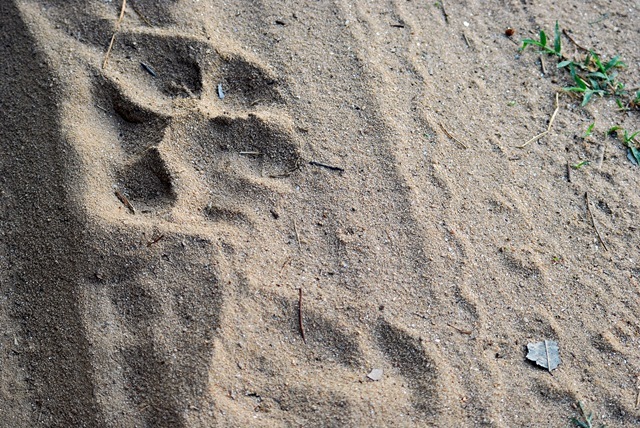 He told our park ranger that the search was still on; the elusive tiger was yet to be found. He waved goodbye and disappeared behind our jeep, eyes peeled for the animal most tourists have come here to see. Meantime, we savoured in the rich diversity Kanha had to offer with fantastic sightings of jackal, leopard, jungle cat, barking deer, peacock, langur and gaur. 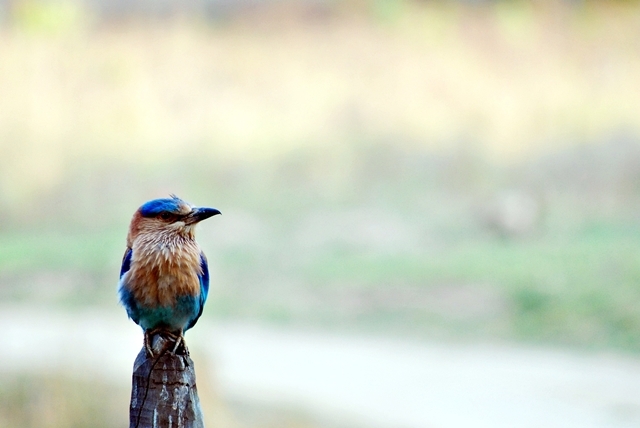 With over 350 species of birds, introduction upon introduction were made with every sighting and bird call. 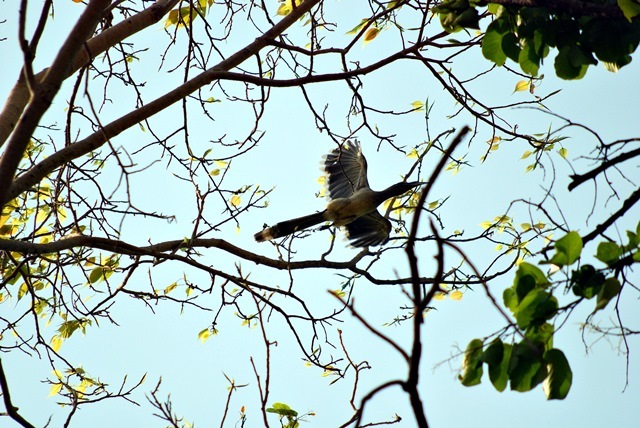 From green bee-eaters to Indian rollers to grey hornbills, this was a treat for bird enthusiasts and nature lovers alike. As mid morning approached, a picnic was laid out for us with the forest as a backdrop. Tea, coffee, sandwiches and fruit were passed around and while we savoured our breakfast, our park ranger scrambled to the office to check if the mahout had recorded sightings of tigers. He rushed back with great excitement and urged us to hurry along. A tigress had been spotted and in order to see her, we went off the beaten track atop an elephant with a mahout. The ride was bumpy and quite an adventure trying to avoid spindly dry bamboo branches from stabbing us. And then we caught sight of her, majestically seated on a bed of earthy-amber leaves, she stared into the open, in her element completely unperturbed by our noisy rustle. Her orange and black coat camouflaged perfectly into the surroundings. She was not only sharing her space with us but also with a large meandering python. She eyed occasionally at the reptile with no intent of making a kill, just like Shere Khan and Kaa from the Jungle Book. Most of us when asked to conjure up an image of a tiger imagine a man-eating predator skulking through the steamy jungles of southern Asia, particularly in the subcontinent of India. Here in Kanha, tigers are friendly, welcoming and accustom to the scene of jeeps and clicking cameras. There is a strong unspoken bond between tiger and human. As a result of tourism, conservation efforts such as ‘Tour Operators for Tigers’ (TOFT) have emerged forming alliances among Indian operators in order to promote best practices in wildlife viewing. Over the years, the Indian government have also realized the need for stricter monitoring and census in order to keep the tiger population at a healthy state. Imagine azure blue skies shifting into shades of pale crimson and calming ginger staring into a canvas of endless ocean – picnic blankets laden on spiky lawns, families nuzzled together on pillows and a good book to read, couples toasting, the guitar playing and carefree laughs between friends. That’s the sort of scene one will chance upon when the sun begins its slow descent into the horizon. Relishing in the relax culture of Cape Townians, we headed to Signal Hill and the waterfront on two separate evenings to picnic. Terence cooked Asian fried rice, I packed salad, we picked fruits and had the most relaxing and undisturbed dinner in a long time. 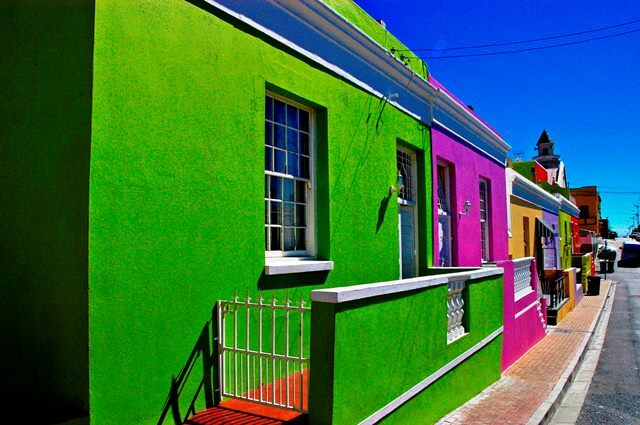 Determined to pamper ourselves silly before we head on home, we booked us a room at Rouge on Rose, a charming boutique hotel on the corner of Rose Street at the Bo Kaap District. The owner, Ursula was a stylish and motherly. She took care of all our needs making sure we had breakfast on time so that we don’t miss church on Sunday and our flight on Monday. Her small fleet of staff felt like family as we laughed and exchange stories of how our day has been. We were spoiled with fine hearty meals cooked to precision. Imagine French toast coated with honey, crisp bacon and light cream cheese – who would have thought of that concoction?! Needless to say the room was a delight. Spacious, modishly designed with a touch of rouge here and there. The designers have adopted an open concept, which means open indoor showers and gaping archways leading from lounge to bedroom. Alas a cherry on top to cap our awesome two and half month adventure – there would be no better place to toast and cheer than at Mount Nelson. 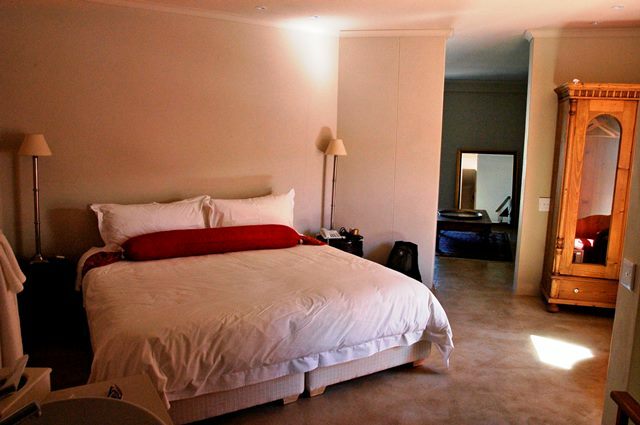 This Victorian vestige is pearl of pleasure with majestic views of Table Mountain and superior service. 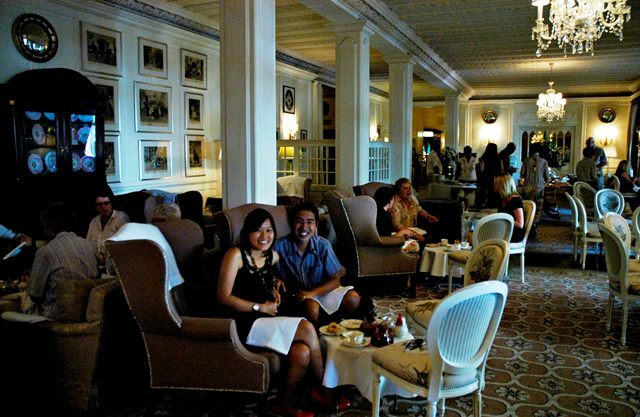 Decorated for splendor, the hotel serves up a full table of lip smacking pastries, desserts and savories for tea. With an endless list of teas to choose from and the perpetual delights that come floating out of the kitchen, it was hard not to over indulge. I guess that’s the reason why buffet tea time menus like this only exist in luxury hotels because guests have to keep their backs straight, laugh with hands over their mouths and munch on incredibly delicious food instead of stuffing their faces silly. Table etiquette as we know it is actually practiced here! It was hunt number 3 for the monstrous beast. Hunt number 1 failed due to bad weather. We checked in to the backpackers and they told us the weather wouldn’t permit for the next 3 days. Undaunted, we rescheduled as we had more than a week left. 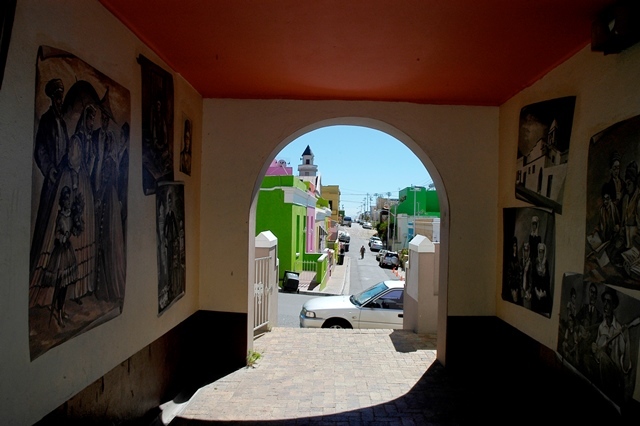 Then the day arrived, I got into the shuttle and midway driving, the driver announced that the weather at Gansbaai isn’t turning out well and we have to turn back. Bad luck! Took my chance again and rescheduled (3 more days before we leave) and it was big risk, considering the weather (at Gansbaai) doesn’t look too good. This time, no turning back and minutes after the briefing, we were in the boat ready to hunt. Upon anchoring, our divemaster gave us a briefing and a rundown about the island and surrounding. 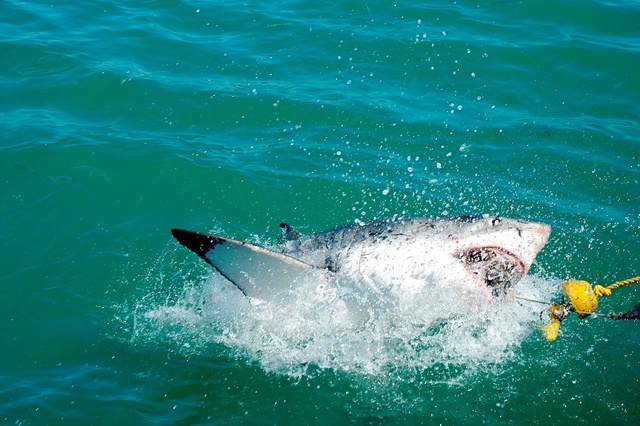 He mentioned that we could wait up to 3 hours to lure the sharks and we’ll be hoping to spot at least one today – since it’s summer and not the greatest time to view white sharks. 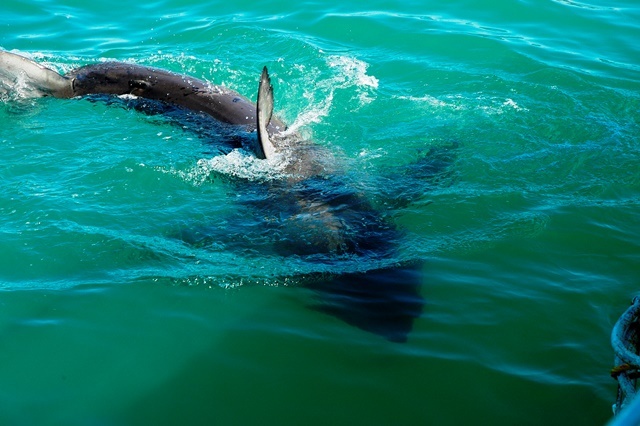 Then all of a sudden, we all clamoured to the side of the boat as the crew spotted something… lo and behold, the sharks! 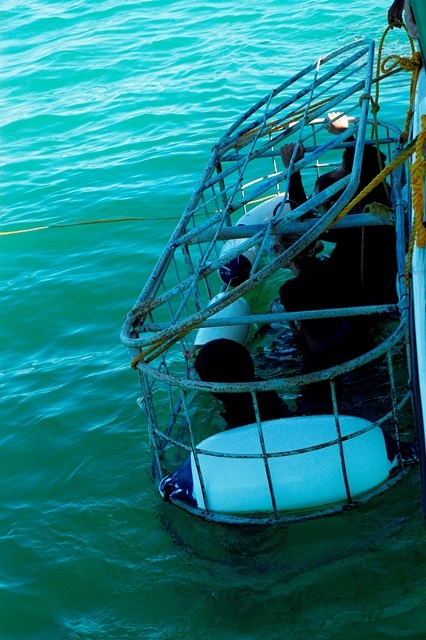 Very quickly, we got into our wetsuits and with sheer excitement I was the first to get into the cage. Only 5 were allowed in the cage at once. 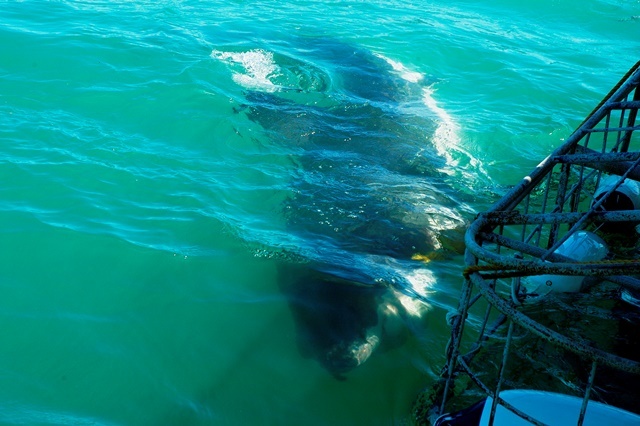 As they lure the shark to its bait time and time, we got full view of the monster and sometimes it would “crash” into the cage leaving us a sheer thrill to savour! After four hours either viewing the Great White from the boat or in the water… it was an unforgettable experience to say the least! 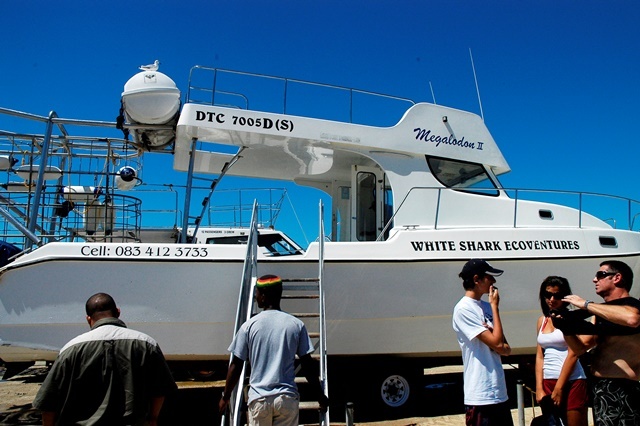 Interesting fact: In February 2009, across all shark diving industry in Gansbaai, they spotted 0 sharks. Fast forward a year, and they’ve spotted countless of them already. That goes to show how the weather and seasons are changing across the world. Maybe it’ll snow in August (in Europe) one day! The day danced through splendidly and tastefully after finishing tea at the luxurious Mount Nelsons Hotel. We drove to Cape Point to catch a glimpse of the fiery sun setting under the vast Atlantic ocean. 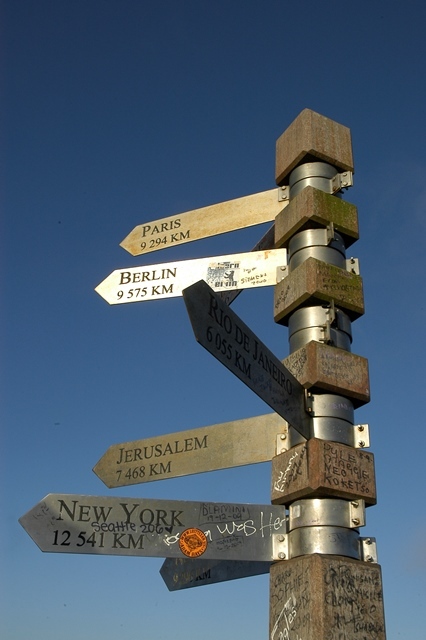 Cape Point is the most southerly point of the entire continent where the two oceans meet – Atlantic Ocean and Indian Ocean. 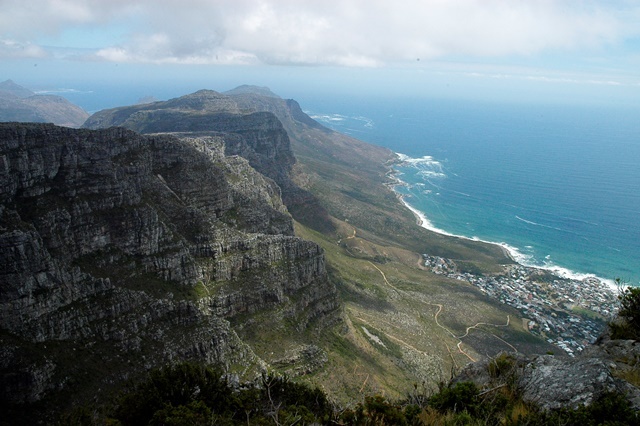 The drive along Chapman’s Peak towards Cape Point had already stolen our breaths away as we cruised through wild waves on the right and massive mountain cliffs on the left. Para-gliders sliced through the wind as their parachutes tossed them up few metres above the waves. The sun had already started its slow descent as we reached Cape Point. Eager to climb to the top where the light house stood we parked the car and grabbed the camera leaving our bags behind. 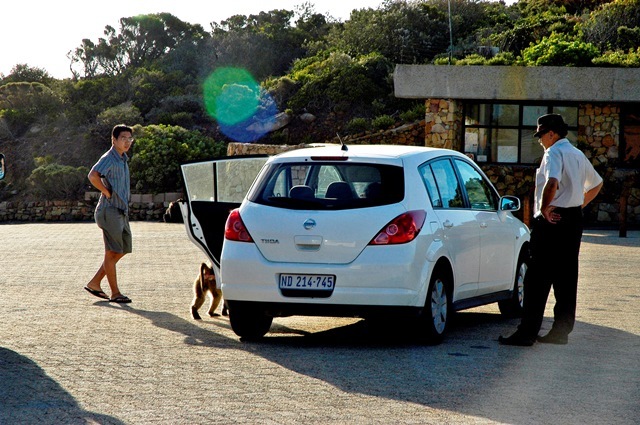 In a split second between getting out of the car and closing the door, a baboon came charging at me. 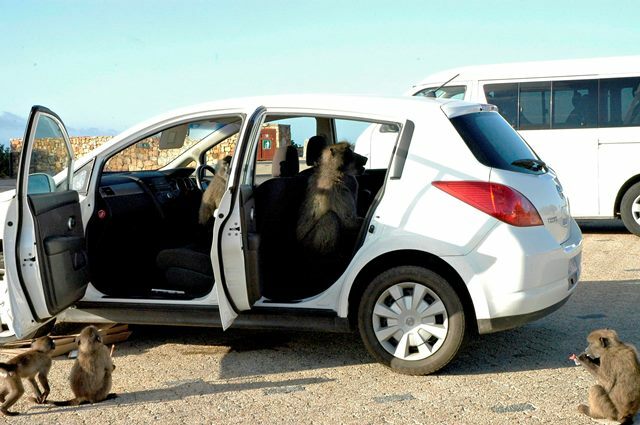 Out of impulse I clambered back into the car and shut my door – to my horror the baboon beat me to it by opening the back door and snorted in my face. I ran out keeping my door open. Terence turned back, now a few feet from the car came running to my rescue (or rather the car’s rescue). We shooed and made all kinds of noises, but to no avail. The ugly beast had now summoned his entire family and was now having a Bratty Bunch Party in our car. They rummaged through every compartment in the car, opened Terence’s bag (yes, even the zip!) and sieved through everything that was edible and left everything that was non-digestible in a mess! Twenty minutes of havoc continued. Thankfully people came to our rescue – a tour guide who was once in the army, a lady from the tour group and a few German men big enough for me to hide behind. Cars pulled over to watch, people stopped in their tracks while others apologetically took pictures. The baboons had created a scene newsworthy for a story! We played a game of opening and closing doors, in and out the baboons went. Alas! We got them all out of the car, pressed the central lock and sealed our car to safety. The baboons walked off slowly, showcasing its menacing teeth and walked away into the bushes. We carried our hike up the lighthouse with a lingering tremor and a lot of good humour as we watched the sun set into the horizons. We now have another WILD story to tell!